TeleTracking software transforms patient flow in a hospital, our brief was to create videos that bring to life the amazing difference they make. We created an animation to explain what the software does, showing the patient flow and the difference across a hospital system. The animation follows a patient’s journey to A&E and through a hospital and features the nursing staff trying to find beds. A ‘change moment’ with TeleTracking software shows the difference to the patient and nurse experience. TeleTracking uses it to introduce the concept for staff and managers when rolling out the software in a hospital. It also sits on the homepage of the TeleTracking UK website. The homepage bespoke animation was created with our professional animators. They developed a visual style unique to TeleTracking. 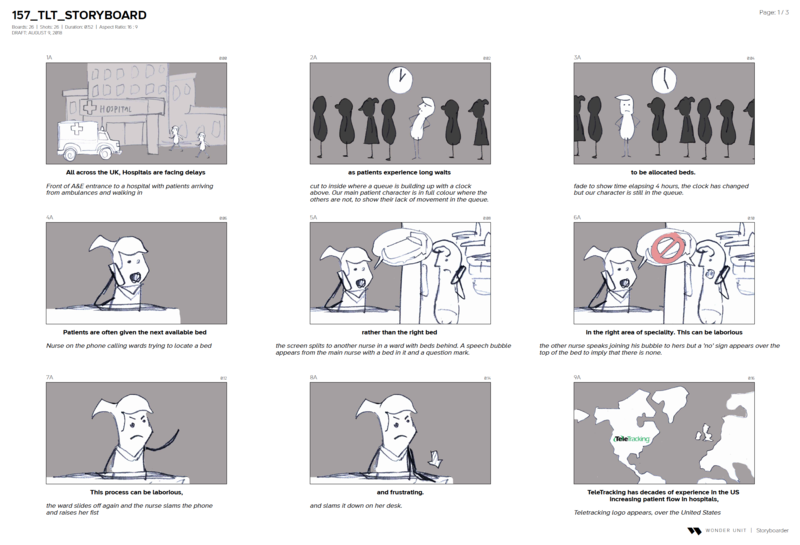 We worked with the client to develop the script, and then the animation was storyboarded. The voice-over was recorded and finally the animation was built. At one of TeleTracking’s flagship sites, University College London Hospitals Trust Foundation Trust (UCLH), we filmed a live case study, to capture the difference the software makes for different job roles in a hospital, including the Clinical Director, the Nurse, the Matron and the Bed Manager. The series was also edited into a 2-minute overview film, and a shorter, snappier film for showing at conferences. See ZPB’s YouTube channel for all our videos.